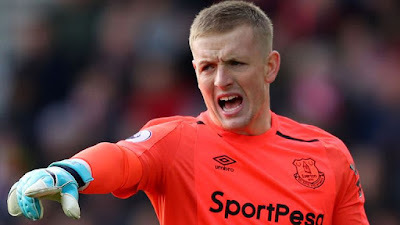 Everton goalstopper Jordan Pickford has spoken about the club problem of always conceding from corner kicks and also reveal the club has it own way of defending corners. Everton drew their game on saturday against Huddersfield and the goal came from a corner kick which their goalkeeper wasn't happy with. Despite them still being unbeaten this season in the Premier League, Pickford has revealed they need to work hard in training after the international break and look for a way to stop conceding from corner kicks. In an interview with Sky Sports, the England international point out what they need to do and how they can stop the goals from coming in. 'The main thing is not to concede and we have conceded too many. It has cost us four points in the last three games. Everton next game will be against West Ham after the international break.